In February I made it to Outamba Kilimi National Park, and surprisingly, it’s not that difficult to get to with a tarmac road for a good stretch of the way. More people should put this on a to do list and not wait 12 years to get there! Four of us hired a vehicle and set off on a Friday morning. The drive was relatively straightforward and took us about 6 ½ to 7 hours. 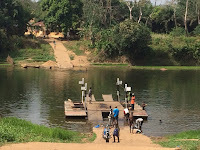 We made a quick stop in Makeni and then continued our drive towards the Northern part of Sierra Leone. We had a picnic lunch off of the beaten track and then continued the last stretch of the journey, which included a ferry crossing. The ferry was one of the highlights – this is the simplest ferry I’ve seen. It fits one vehicle and the ferry is manually pulled across! It’s managed by the Sierra Leone Transport Authority, and to our amazement, it’s free. Once across, we continued on the dirt road for another 25 minutes until we reached the sign for OK. After that, it was another 10-15 minutes until we entered the park. We were warmly welcomed by park staff and shown the “menu”, which included options for accommodation, food options and day trips. The huts are simple, and although hot, they meet the basic requirements needed to catch some sleep, basically a bed and a mosquito net. Thankfully the mosquito nets are of good quality and gave me the confidence that any creepy crawlies would stay out. My sleep was quite interrupted, however, due to roving bush pigs and mischievous monkeys throwing some kind of pit/seed at our hut throughout the hours of the night. Ow fo do. That’s nightlife in the rainforest for you. There was no running water, except for the running water in the river! So any bathing, dish washing, etc. was done in the river. Thankfully we brought a gas cooker and were able to prepare our own meals, although otherwise, food would have been available for purchase from the village. Be careful not to leave out any food while you’re not near your hut. While we were bathing in the river we watched a cheeky monkey sneak over to our hut and run off with a banana! Saturday morning we crossed the river and went on an amazing walk through jungle, forest and savannah like landscapes. We reached the top of the hill and marveled at the 360 views. We saw elephant and buffalo foot prints, which was impressive, but unfortunately the animas are only ever in the park at the height of rainy season. 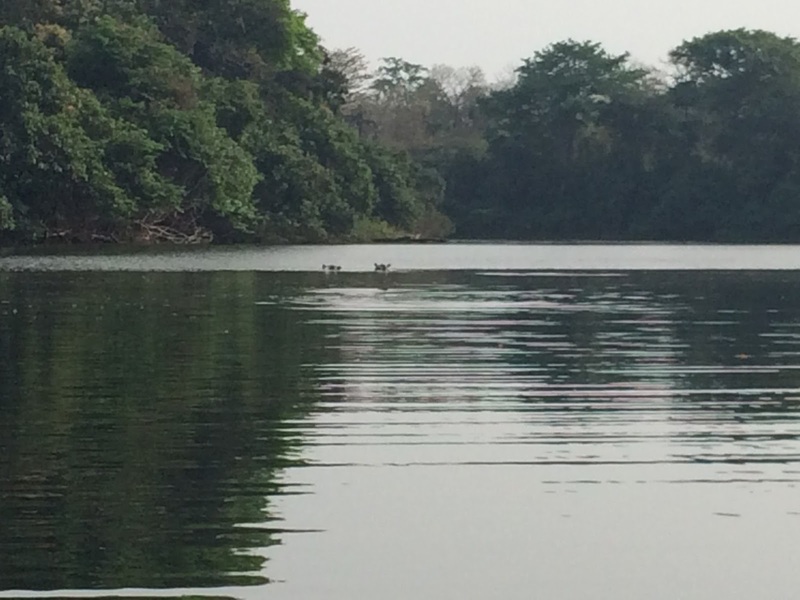 In the evening we ventured out in canoes to seek out the hippos. Yes, they are ranked as one of, if not the most dangerous mammal in Africa and we were going out in canoes to find them. It was both thrilling and scary. About 30 minutes into the canoe ride we spotted the group of hippos. 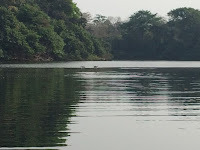 We stationed our canoes at the waters edge and watched the hippos as they would submerge and then come up again a few minutes later, sometimes in the same spot, sometimes in a new location. It felt like we were pretty close and I hoped they weren’t slowly creeping up on us while underwater and out of our sight. Our guides make this trip all the time, so we had to trust their judgment! The sights and sounds were incredible. The other creatures we encountered were mosquitoes and black flies. The flies were especially terrible during the boat ride and I managed to get bitten a number of times. In the evenings, despite long sleeves and lots of insect repellant (even spraying our clothes), we got covered in bites. Thankfully none of us got sick in the weeks to follow. Maybe thanks to malaria prophylaxis! So, be aware, there are many insects to contend with. After a great adventure in the park, we packed up the vehicle on Sunday morning and made our way back to Freetown. I had to make a quick photo stop in Sanda Loko Chiefdom, since this is the chiefdom that closely resembles my name and this was the first time for me to drive through it. I would highly recommend a trip to OK. We didn’t call in advance but if you want to make sure there’s space you could call ahead of time, network permitting, and make arrangements with Mohamed, +23288606632.